PALS Reusable Neurostimulation Electrodes combine patented stainless steel knit fabric and two-layer adhesive gel construction with exclusive impedance compensation system. Offer maximum conformity and adhesion to even the most irregular surfaces. Designed for all FES and TENS applications. PALS Reusable Neurostimulation Electrodes combine same patented stainless steel knit fabric and gel construction as standard PALS Platinum Electrodes but feature a soft foam top. Designed for all FES and TENS applications. PALS Reusable Neurostimulation Electrodes are the best gel choice for extremely sensitive skin. Thick gel facilitates contact when used over hair-covered skin. 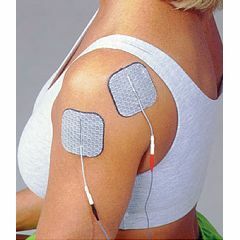 Designed for TENS and muscle stimulation applications. Easy Storage. Safe. Sturdy. Lightweight. Are these eletrodes in single packs inside the case or in pairs? Looking around, it appears that PALS electrodes usually come in a pack of 2 or 4 electrodes depending on the electrode size. When you say a case of 20 or 40, is that the number of individual electrodes, or the number of packs? Thank you for your time and assisitance. first time introduction to electrodes. whar are the pads connected to?